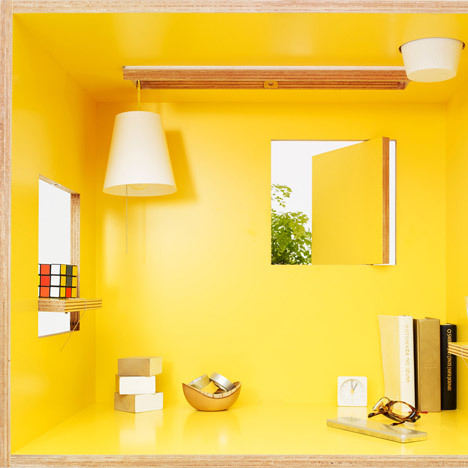 This desk by Japanese studio Torafu Architects looks like a doll's house, with little windows in the walls and a pendent lamp inside. The hatches can be left closed for greater privacy when you need to concentrate, or opened up and used as shelves. There's a round hole in the top to hold a plant pot and a matching stool includes storage space beneath the seat pad. The Koloro-desk was designed for plywood manufacturers Ichiro to showcase their polyester-coated plywood. See more stories about Torafu Architects here. Ichiro-iro is a series of furniture designed for the decorative plywood maker Ichiro. Ichiro creates in-house blends for the paints used in its polyester plywood, demonstrating a consistent dedication to supplying the right color that involves a willingness to custom-tint even single sheets. The concept for the ichiro-iro series is that of 'tools for the real you', where 'iro' is the Esperanto* word for‘tool’. The first items in the series are the koloro-desk and koloro-stool. ‘Koloro’is also an Esperanto word, meaning color, and the koloro pieces have been designed to make optimum use of the vibrant polyester decorative plywood at which Ichiro excels. The koloro-desk has windows at various locations, opening to give a more open and accessible feel while a small private room where no one can disturb you is created when closed. Lighting and potted plants can be added, and there are windows for displaying the occasional ornament, hooks for bags, and a cord manager allowing PC use. Arrange the koloro-desk to make a study for Dad, a play area for a child, a hobby space or however you like it to be. Designed to complement the koloro-desk, the koloro-stool is shaped like a vaulting horse, and under the soft cushioned seat is a box for storing toys and other small miscellaneous items. * Esperanto was devised as a common international language allowing people all over the world to communicate more easily.